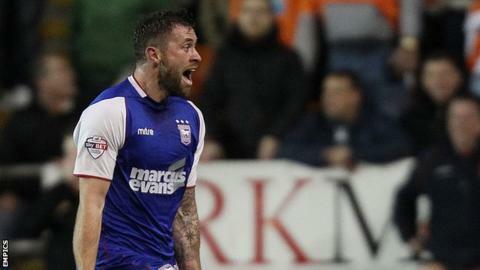 Daryl Murphy's first career hat-trick fired Ipswich to an easy Championship win over struggling Rotherham. Brett Pitman steered in Kevin Bru's cross before Jonathan Douglas thumped in a 25-yard shot to double the lead. Murphy pounced on poor defending either side of half-time to make it 4-0, his first goals of the season. Manchester City loanee Brandon Barker's superb strike and Matt Derbyshire's volley reduced the deficit, but Murphy had the final say with a low finish. The hosts fell behind early on when poor defending from Paul Green allowed Bru to whip in a cross which Pitman sent into the bottom corner. It got worse for Green when he was robbed of possession by Douglas, who advanced and planted a low 25-yard shot into the bottom corner. Millers keeper Lee Camp produced two superb saves, but Murphy made it 3-0 before half-time when more slack defending allowed him to slam home from eight yards. And just three minutes after the break Murphy capitalised on more generous defending to drill home from an angle. Debutant Barker cut inside and sent an arrowing shot into the top corner from 20 yards before Derbyshire superbly volleyed home from the edge of the area. But Murphy completed his hat-trick with a low finish as the Tractor Boys made it four matches unbeaten and consigned rock-bottom United to their fifth defeat in six. "It started in the first minute, really tentative, nervous, I don't understand why we needed to play like that. "We were really negative in midfield, we didn't get close to them, we didn't work hard enough, we didn't do the ugly stuff well. "The biggest thing for me is the bare minimum the supporters can expect is the effort, the endeavour and whoever comes to play is in a game. "If we're a little bit short and they're better then you can't get round that. But the goals are so easy, Ipswich haven't had to work hard for their goals." "It was a great game for us, it should have been better, but I don't know how better a 5-2 victory away from home gets. "Overall, it was an outstanding performance, we put five in and we could have put another three or four in. We were running riot in the first half. "I'll enjoy the result and performance, but their two goals could have cost us. I don't like that, we should have been more secure than that." Match ends, Rotherham United 2, Ipswich Town 5. Second Half ends, Rotherham United 2, Ipswich Town 5. Jonson Clarke-Harris (Rotherham United) wins a free kick on the left wing. Foul by Jonathan Parr (Ipswich Town). Substitution, Ipswich Town. Jonathan Parr replaces Daryl Murphy. Foul by Jonson Clarke-Harris (Rotherham United). Jonathan Douglas (Ipswich Town) wins a free kick in the defensive half. Substitution, Rotherham United. Lewis Buxton replaces Harry Toffolo because of an injury. Delay in match Harry Toffolo (Rotherham United) because of an injury. Attempt blocked. Jonson Clarke-Harris (Rotherham United) header from the centre of the box is blocked. Assisted by Brandon Barker with a cross. Corner, Rotherham United. Conceded by Daryl Murphy. Attempt blocked. Jonson Clarke-Harris (Rotherham United) left footed shot from outside the box is blocked. Assisted by Grant Ward. Attempt missed. Giles Coke (Ipswich Town) right footed shot from outside the box is high and wide to the right. Assisted by Brett Pitman with a headed pass. Attempt saved. Christophe Berra (Ipswich Town) header from the centre of the box is saved in the centre of the goal. Assisted by Ainsley Maitland-Niles with a cross. Substitution, Ipswich Town. Giles Coke replaces Freddie Sears. Corner, Ipswich Town. Conceded by Harry Toffolo. Attempt saved. Brett Pitman (Ipswich Town) right footed shot from outside the box is saved in the bottom left corner. Assisted by Freddie Sears. Attempt missed. Danny Ward (Rotherham United) header from very close range is too high. Assisted by Brandon Barker with a cross following a corner. Corner, Rotherham United. Conceded by Tommy Smith. Attempt missed. Jonson Clarke-Harris (Rotherham United) left footed shot from the left side of the six yard box misses to the left. Assisted by Danny Ward with a cross. Goal! Rotherham United 2, Ipswich Town 5. Daryl Murphy (Ipswich Town) left footed shot from outside the box to the bottom right corner. Assisted by Luke Chambers. Harry Toffolo (Rotherham United) wins a free kick in the defensive half. Foul by Ainsley Maitland-Niles (Ipswich Town). Substitution, Ipswich Town. Ainsley Maitland-Niles replaces Kevin Bru. Attempt blocked. Brandon Barker (Rotherham United) right footed shot from outside the box is blocked. Attempt missed. Jonson Clarke-Harris (Rotherham United) left footed shot from outside the box is too high. Assisted by Harry Toffolo. Corner, Rotherham United. Conceded by Christophe Berra. Goal! Rotherham United 2, Ipswich Town 4. Matt Derbyshire (Rotherham United) right footed shot from the right side of the box to the high centre of the goal. Assisted by Grant Ward. Offside, Ipswich Town. Dean Gerken tries a through ball, but Daryl Murphy is caught offside. Attempt blocked. Freddie Sears (Ipswich Town) right footed shot from outside the box is blocked. Assisted by Jonathan Douglas. Corner, Ipswich Town. Conceded by Richard Smallwood. Goal! Rotherham United 1, Ipswich Town 4. Brandon Barker (Rotherham United) right footed shot from outside the box to the bottom right corner. Assisted by Jonson Clarke-Harris. Attempt missed. Luke Chambers (Ipswich Town) right footed shot from outside the box is high and wide to the left. Assisted by Brett Pitman. Goal! Rotherham United 0, Ipswich Town 4. Daryl Murphy (Ipswich Town) left footed shot from the centre of the box to the bottom right corner. Assisted by Tommy Smith with a headed pass. Second Half begins Rotherham United 0, Ipswich Town 3. Substitution, Rotherham United. Jonson Clarke-Harris replaces Tom Thorpe. Substitution, Rotherham United. Richard Smallwood replaces Paul Green. First Half ends, Rotherham United 0, Ipswich Town 3.